Maps are so beautiful. I’ve been looking for some ways to use them because I see them everywhere (including my glove box). Just like CD’s, record albums, and books, they are becoming obsolete due to the emergence of electronics like the GPS and the internet. 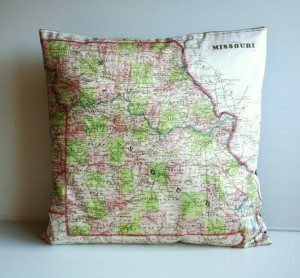 But what I do love about maps is that they tell a story and simultaneously serve as a work of art. Here are six great ways to recycle maps. Check out these heart maps by Tcktyboo. 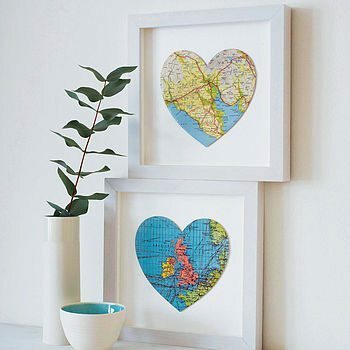 Each heart represents a special place. 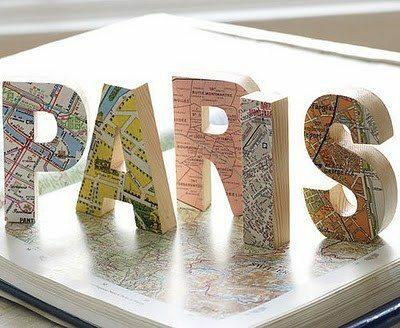 For example, where you were married, where you went on your honeymoon, or where the kids were born. 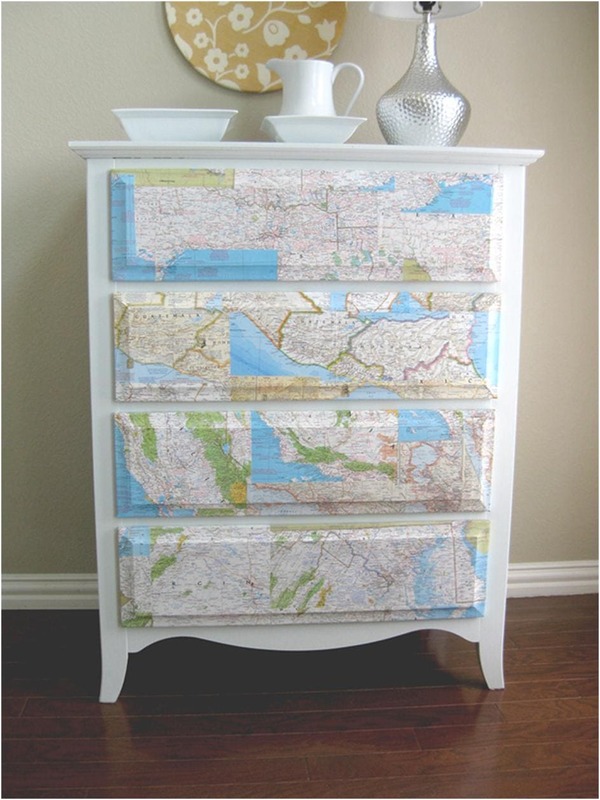 I also saw a great idea on Pintrest (I can’t find the picture or source anymore) where a map was framed and the route to a special trip was stitched in a coordinating colored string… so cute! Update! 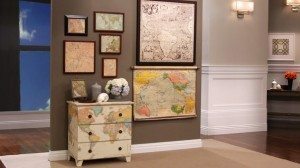 Thanks to Adri, here is the link for that map! 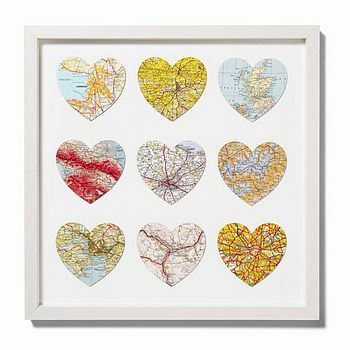 http://www.marthastewart.com/375160/map-artwork Thank you, Adri!!! This is a pillow from Etsy inspired by a vintage map. Another Etsy find, these cute pinwheels make a whimsical vintage wedding favor. 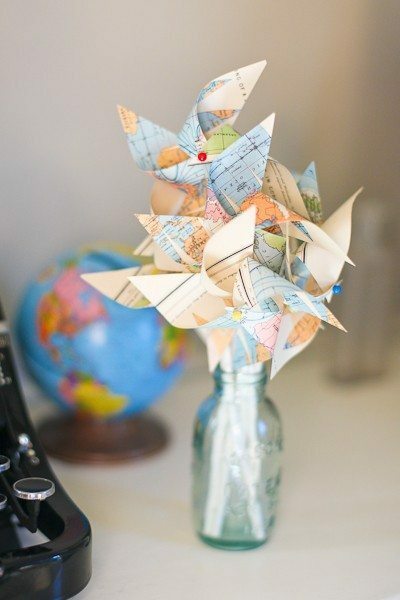 Click here for different pinwheel tutorials. 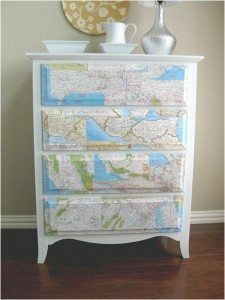 Here are three great examples of using decoupage on maps to turn an old piece of furniture into a unique and beautiful conversation piece. 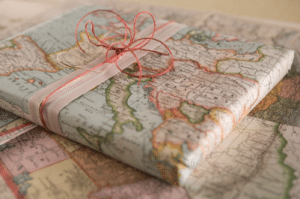 Just in time for the holidays, use an old map as gift wrapping paper. Use decoupage to commemorate a trip on craft letters (source unknown). I forgot to mention that this is my 200th post!!! WOW! 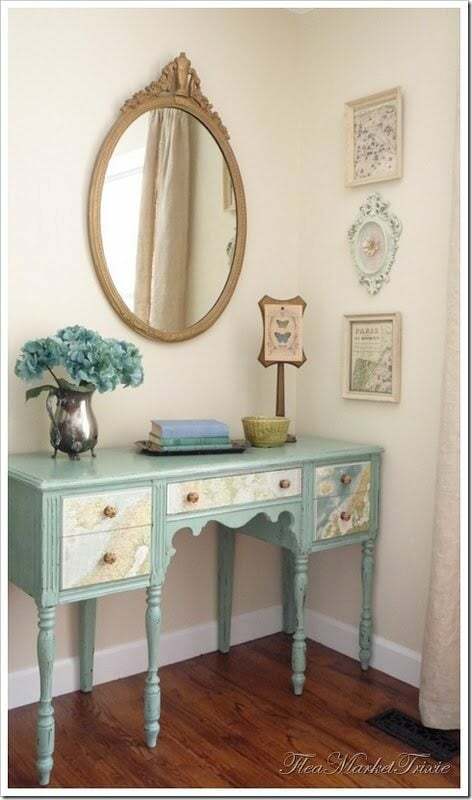 Absolutely LOVE these great furniture ideas. 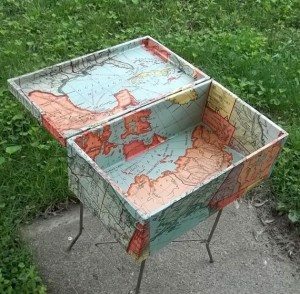 A while back I covered the top of a vintage desk with a world map. Painted it blue. It turned out super cute! I sold it though. 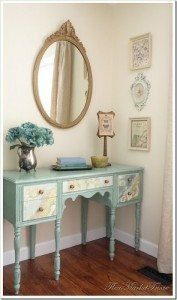 I would like to create a link from my blog site to yours showing these fabulous pieces. Perfect! I will add it! Thank you, Adri!